Spirit cults of various types, generally associated with fertility and the wellbeing of humans, permeated the New Guinea Highlands in pre-contact times. The Wiru of the southern highlands region made flat woven figures called 'timbu wara' as part of the 'timbu' cult. By the mid 1960s the 'timbu' cult had all but disappeared. In the Wiru language 'timbu' means 'sky', suggesting a connection with the powerful sky spirits. 'Wara' has differing interpretations, meaning both 'spear' and 'guardian', indicating power, protection and perhaps even aggression. Indeed, these spirits of the sky, although having no direct interaction with humans, were feared; they could affect the human condition adversely and were to be respected and, at times, honoured. That 'timbu wara' were painted on shields reinforces the notion of their power and importance. Moriarty suggested that the shield pictured in fig 9.2 depicts a 'timbu wara', as it is painted in similar colours and is of the same form. It is probable the 'timbu' was regarded as a protective spirit, whose image could give power to a warrior. Many 'timbu wara' have this pointed form to the head; indeed, the echidna is of particular significance, as some important stone figures discovered in the highlands have an echidna form. According to archaeologist Pamela Swadling, most of the stone figures – found in forested areas outside settlements – are associated with fertility and hunting. (5) There are possible connections between the stone figures and the 'timbu wara' in how they were used. Two 'timbu wara' figures in the South Australian Museum are decorated with hornbill beaks. The 'timbu wara' shown in fig 9.1 is similar in form to the figure collected by Stan Moriarty, with the beak of a hornbill mounted on a proboscis-like head, reinforcing the connection between the figure and birds in particular, but also wildlife in general. These seem to encapsulate diverse forms – male, female, animal and bird – and are thus linked to nature in its widest sense. 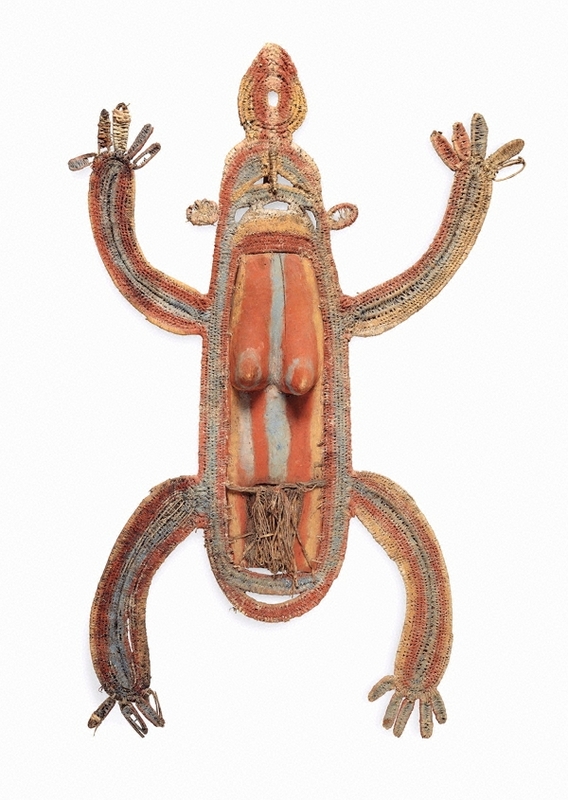 Chris Boylan, 'Timbu wara (ritual spirit figure)', in Natalie Wilson (ed), Plumes and pearlshells: art of the New Guinea highlands, AGNSW, Sydney, 2014, pp 50-53. (1) Pamela J Stewart & Andrew Strathern, 'Timbu wara figures from Pangia, Papua New Guinea', Records of the South Australian Museum, vol 34, no 2, 2001, pp 65–77. (2) Stewart & Strathern, p 71. (3) Moaga interviewed by Ron May, former senior fellow in the Department of Political and Social Change, Research School of Pacific and Asian Studies, Australian National University, Canberra, field notes, 1975. (4) The long-beaked echidna (Zaglossus bruneiji); Chris Boylan conversation with David Attenborough in Sydney in the 1990s and field notes, 1982 and 1988. (5) Pamela Swadling, 'Early art in New Guinea: glimpses from prehistory', in John Friede, Terence Hays & Christina Hellmich (eds), New Guinea Highlands: art from the Jolika Collection, Fine Arts Museums of San Francisco with DelMonico Books/Prestel, San Francisco (forthcoming). (6) The author's personal communication and field notes, 1982 and 1988.